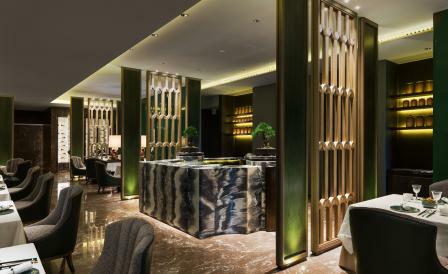 Hong Kong-based architect Andre Fu, has reinterpreted one of the most famous ancient rock gardens - built in Suzhou in the 14th Century - for a modern Chinese restaurant in Seoul’s newly opened Four Seasons hotel. Fu says his intention was to create a ‘poetic journey’ through the 5,800 square meter space. ‘It has the texture and poetry of a rock garden but presented in a very modern way,’ he explains. Here, subtle references to the classic landscape are interwoven in an earthy colour and material palette featuring pale green emerald lacquer, rich brushed brass and cloud-like patterned marble that hints at classic ethereal Chinese ink paintings. The muted effect is offset by decorative flourishes including a strikingly contemporary tree branch wall sculpture created by Korean artist Lee Gill Rae and Fu’s elegantly simple take on the traditional Chinese knot, a graphic motif that is given a new twist in tall 3-dimensional lattice screens placed between tables. Meanwhile, a dramatic modern Tea Bar carved from a light grey marble intershot with dark racing green swirls and topped with meticulously groomed Bonsai trees takes centre stage. We’d recommend reserving one of the seven generously sized private dining salons for a glimpse of the designer’s custom-design ceiling pendants of curved crystal rods, the perfect modern counterbalance to Yu Yuan’s signature dish, a wonderfully crisp Peking Duck.